There are approximately 30 million businesses currently operating in the United States and all of them are trying to reach through the clutter with a brand presence and compelling story. The digital age is upon us, and with hundreds of communication platforms and infinite possible applications, the world of online marketing is a complicated yet very rewarding area for small business development. Maybe you’ve never tried to establish a strong online presence, or maybe you’ve tried many different strategies with lackluster results. As an entrepreneur, your time and resources are already stretched, and you’ve probably told yourself at least once that you don’t have the time to develop a strong online marketing strategy. Well here it is. This guide exists to help you understand, build, and eventually maintain a powerful, integrated online presence. It won’t happen overnight, but with a little bit of dedication and the right resources to back you, you can accelerate your small business’s online presence to a formidable level. Your website is going to serve as the foundation of your total online presence. It’s 2018. People are searching for you. If your business doesn’t have a website, or if your website looks like it was created in the 1990’s, your customers and potential customers are immediately going to be left with a bad impression. In order for your website to do its job (generating interest in your company and driving new leads), you need to make sure your website is adequately designed, intuitive to navigate, and full of rich, engaging content (almost 50 percent of all online sales are lost simply because visitors could not find the content they needed). Without these elements, your website will not be able to serve as a solid foundation for your other digital applications. As a company, you’ll need to stay up-to-date with the latest design standards in order to maximize your possible audience. One of the most important qualities of a modern website is its responsiveness, or in simple terms, its ability to adapt to different technologies that are accessing it. People access the Internet on desktops, laptops, tablets, smartphones, and everything in between—you need to make sure your website is easily accessible and navigable for all of them. Other popular trends in modern web design include Parallax, a perspective trick done with the background and foreground of your site, and Metro, which focuses on neat tile-based arrangements. A major key to getting a strong first impression and retaining your long-term customers is your consistency in updating your website. This includes not only short-term updates, such as regular blog posts, but also long-term updates, such as revisiting the design and layout of your site every few years to see if it still fits modern standards. Once you have a solid, modern website, you can start showing it off through various peripheral marketing channels and letting it naturally attract more customers to your brand. Without a way to measure your traffic and impact, you won’t be able to monitor your progress or weed out ineffective strategies. A common choice for online analytics is Google Analytics, which is used by 51 percent of all Fortune 500 companies. Accounts are free to create and they provide users with many detailed reports on traffic, visitor location, time on site, and even basic conversions. However, after viewing reports and seeing the high level metrics they provide, users typically get to a point where they ask “So what?” It’s a great question and should be a trigger to identify additional tools that can help interpret the analysis, rather than just presenting it. Marketing technology companies have developed software that not only measures vanity metrics, such as website traffic, but can identify visitors based on their network and IP address. Combine that information with Dun & Bradstreet data, and this reverse IP lookup allows you to identify company and contact information, instead of anonymous pageview counts. Measuring lead score is essential if you’re running an inbound marketing strategy that continuously captures potential leads into your sales funnel. Not all leads are created equal and this metrics identifies the lead quality, instead of the lead quantity. Always optimize your marketing tactics to quality first, and then scale it with higher quantity channels. Measuring lead conversions is a useful metric for determining the effectiveness of your offers and copy at getting information from potential leads. Essentially, this measures the number of people who seek further information from a landing page, call to action, or other lead conversion method. Measuring visiting companies is useful because it tells you the name, location, and high-level contact information of what type of visitors are coming to your website. Measuring total traffic is useful to track overall visits to your site. It’s a good metric for determining how effective your marketing strategies are at leading people to your website, which should be the foundation of your online marketing campaign. Measuring search engine keywords helps you understand how your visitors are finding your website and gives you a heartbeat of your search engine optimization efforts. Countless studies have proven that higher ranked websites get more traffic. If your traffic has gone up for a particular keyword, you might have some low-hanging fruit opportunities available to you. Measuring referrals is great for pinpointing which of your strategies are most effective at getting people to your site. You can track visitors from social media sources, blog posts, email blasts, or anything else you use to drive traffic to your site. Measuring time spent on your site is another useful tool, especially if you’re engaging in a content marketing strategy or if you feature an e-commerce platform. This can help you determine how effective your site is at keeping visitors on site. Gathering analytics is only half the battle. Once you are able to identify these key metrics for your online marketing strategy, you can interpret them and use them to refocus and improve your overall strategy. For instance, if you find yourself with a large number of referrals from one source, increase your attention on that source. Over time, you’ll find and perfect a rhythm of adjusting your strategy and analyzing the results. The more time and effort you invest in your analytics, the more they’ll pay off. The bottom line for most small businesses is getting leads; the more leads you get on a consistent basis, the more sales you’ll have, and ultimately, the more revenue you’ll have to work with. Landing pages are a common online tactic to direct traffic and get valuable information. Landing pages are often separate but related to your main website, designed to give a basic description of your company and request a few points of information from your potential leads. You can use landing pages in a number of different ways, including PPC campaigns, social media efforts, or even printed advertising. In order to capture the widest range of possible leads, you’ll have to tailor your approach to a specific target audience. Trying to market to everyone is an ineffective strategy, since you cannot cater to multiple interests and behaviors simultaneously. Instead, focus on one key audience, even if it’s only a segment of your potential customer base. This will allow you to create a design, voice, and ad placement strategy that will specifically and powerfully appeal to one group of people. For instance, a financial services institution might focus on seniors preparing for retirement, and create a landing page that offers a sample retirement plan as a reward for entering their information. Once you spend some time observing how users spend time on your site through analytics, you’ll be able to adjust and perfect a highly targeted lead generation strategy. The best strategy to generate the most leads is to harness multiple channels. This means leveraging multiple campaigns that complement each other, such as an email marketing strategy that works together with a regular content marketing program. Before you get too concerned with the costs of a lead generation campaign, consider that your bottom line is your return on investment, or ROI. Consider two businesses: the first spends $200 on a campaign and sees approximately $200 in new business as a result. The second spends $2,000 on a campaign and sees $3,000 in new business as a result. The first campaign required less of an investment, but the second campaign brought in a higher proportion of business. Lead generation is not about how much money you put in; it’s about how well you use the money you put in. The longer you run a lead generation campaign, the better equipped you’ll be to focus on channels that work. It takes time and careful analysis to become efficient at generating leads, but once you do your ROI will skyrocket. Search engine optimization, or SEO, is an inbound marketing tactic that improves your ranking on search engines so people searching for your products and services can find you easier. It’s a cost efficient, long-term strategy you should consider including as part of a multi-channel online marketing campaign. SEO strategies are always changing because search engine giants like Google are always refining what should constitute a higher ranking. Old SEO involved a focus on keywords and links to boost rankings, while new SEO techniques focus more on generating consistent, high-quality content that define you as an author on a topic. New search engine algorithms are able to weed out unnatural or irrelevant uses of language, so to improve your rankings, you need to make sure your content is both clearly written and useful to your target audience. Not only is it better for your presence on search engines, it’s also better for your general reputation—90 percent of customers in the market appreciate sources of quality content. SEO is not a way to instantly get traffic. It is a long-term strategy that pays off only after months of consistent effort. You cannot pursue an SEO strategy and expect it to pay off unless you are very consistent in the quality, frequency, and relevance of your posts. Websites with regularly updated blogs see up to 67 percent more leads than those without.  A solid SEO strategy in the modern age revolves around publishing good content and posting quality links to your site. It’s possible for any business owner to do this in house for relatively low costs. However, in many cases it is better to work with an agency that specializes in SEO. Agencies tend to have better analytics, more experience in performing relevant keyword research, and greater access to popular syndication channels. Just make sure your agency of record uses natural English speakers and doesn’t rely on black-hat SEO techniques to climb ranks. Social media is a tactic of online marketing that many small businesses acknowledge as useful, but fear using due to lack of understanding or time restraints. Twenty-three percent of all time spent online is spent on social media platforms—and if you aren’t taking advantage of that, you need to start. Small companies have a big opportunity to gain favor in the local community by leveraging social media platforms. Large corporations tend to miss 86 percent of local feedback because of their size, but the right social media strategy can acknowledge and take advantage of that feedback in a community setting. Some studies suggest the average “value” of a Facebook like is up to $147. Throw in the fact that Facebook accounts are free to create and you have one of the most cost efficient opportunities for online marketing available. The number of different social media platforms available is staggering, but the big three you should start with are Facebook, Twitter, and LinkedIn because of the massive size of their user bases. Creating a company page for each of these platforms is relatively easy. Just make sure you have a profile picture and some information about your company ready to include. Google+ and Pinterest are also good pages to establish. Depending on the nature of your business, you may want to emphasize one platform. For instance, a professional services firm might benefit most from LinkedIn, but a B2C beauty product company would do better on Facebook. Examine your target demographics and determine what they’re using the most and what type of content you can share with them that they would find valuable. Now that you have your accounts set up, it’s time to put them to use. The only way to generate new followers and increase visibility is to interact with your users constantly. Make sure all your posts are worth reading—remember, on social media nobody wants to read a sales pitch. Reach out to people directly. Start conversations. Post personal messages and build a community around your company—people will come to you naturally. Social media is also a perfect way to improve the visibility of your content marketing strategy. Whenever you have a new blog post, press release, or other piece of content, push it out through your social media channels. It’s good for SEO because it encourages links, it’s valuable to your customers, and it’s an excellent way to combine your most important online marketing strategies. Email marketing is an online marketing strategy from the earliest days of the Internet. While some people believe that spam filters and customer apathy are limiting the efficacy of an email marketing strategy, recent statistics indicate that it is consistently a strong addition for your small business marketing campaign. Putting together a campaign is relatively simple; all you’ll need is a written and designed body (which you can base on a template if necessary), a list of recipients, and an email marketing service (ESP) to send the blast. Recent email marketing data shows an average email open rate of about 27 percent, with a 4.5 percent click through. This is a highly viable rate, especially if you already have an email list. In addition, 44 percent of all email recipients made one purchase or more as a result of seeing a promotional email, and email ad revenue reached $156 million in 2012. Remember, a rising percentage of all email viewing is occurring on mobile devices. If your email isn’t viewable on a smartphone, you’ll be missing a critical sector of your target audience. Mobile optimized emails are essential to have in your arsenal. Write a compelling subject line. Sixty-four percent of people open emails based solely on the subject line. Make sure your email fits your brand. Be consistent! Send people things they want, such as free offers, promotional giveaways, and discounts. Become familiar with CAN-SPAM Act, and ensure your practices remain in compliance. Make your content is easily shareable. Tie your email marketing into another marketing channel, such as a social media presence, to capitalize on multiple audiences or to offer complementary content. No matter what approach you take in email marketing, make sure you track your results, including how many people opened the email, how many clicked through, and how many unsubscribed. Internet usage on mobile devices has surpassed PC computers and according to recent data, more than half of local searches are made on a mobile device. A mobile marketing strategy involves appealing to smartphone and tablet users, making it convenient for them to access and engage with your online presence. Mobile optimization includes a variety of factors for things like your website and the format of your emails. Mobile users require a user interface that adjusts to the size of the device accessing it. Meaning, a web page should automatically scale down to fit readably on a mobile device. This is a customization that occurs on a coding level, so you may need to redesign or restructure your website to make sure it is mobile compliant. You can also leverage tools that redirect your customers to a mobile friendly version of your website and allow them to interact with your more targeted content. Communicating with your customers through SMS gives you instant and direct access to them. A study found that 98% of Text Messages are read compared to 22% of emails, 29% of tweets and 12% of Facebook posts. It’s almost guaranteed that everyone on your list will receive your message so your offer better be good. Continue to promote value and you’ll continue to have a loyal audience. Mobile offers bridge the gap between technology and reality. By using mobile offers, your users can instantly and immediately gratify themselves by accessing promotions or content that your company offers. This link helps cement your brand’s reputation, and gives tech savvy customers more reasons to work with or shop at your small business. Consider offering discounts to mobile users, or use a mobile scan option to record entries for a prize drawing. You could also use mobile scanning with printed advertising to draw people to access your site or sign up for an event. The possibilities are virtually limitless. Local optimization is a more important facet of an online marketing strategy for small businesses than it is for large corporations. Most small businesses rely on a local population for a recurring revenue stream and realize this, but many small businesses fail to realize the potential impact an online strategy can have on local residents. More than 20 percent of all searches relate to location, and more residents than ever are relying on online search to find what they’re looking for locally. Local optimization harnesses the power of major search engines like Google, Bing, and Yahoo!, making sure your information appears for local residents who are looking for services like yours. Each of these search engine giants features a “local” search component that helps route people to relevant results based on their geographic location. Local optimization is closely related with both SEO and social media strategies. With Google+, your social media information actually bleeds into your local information. Staying up-to-date with your SEO strategy, social media efforts, and local presence is the key to maximizing your total impact in your geographic area. Registering with local search engine listings means your information becomes immediately available to people seeking you out. This is increasingly critical for an online marketing strategy as users become increasingly impatient. Most search engine users go with the first or second listing they come across, and if it’s your phone number they find—it’s you they’re going to call. People trust their peers more than they do actual companies—even if your presence is personal and social as it should be. Encourage your users and customers to write reviews and testimonials for your products and services on social media and through user review sites like Yelp. Reading an honest consumer review can help people understand that your business is real, and may be the deciding factor in a decision that pits you against one of your close local competitors. Never underestimate word of mouth. Local optimization starts with major search engines, most notably Google, Bing, and Yahoo!. Each of these search engines makes it easy for businesses to register, usually offering a two or three step process to create a new account and a verification process to ensure your phone number and address are accurate. From there, it’s just a matter of building relevance with regular content updates (and an active social media presence certainly doesn’t hurt). Paid traffic is the last major tenet of a comprehensive online marketing strategy for small businesses. Unlike many of the other strategies, paid traffic has a greater degree of certainty. To illustrate, first understand that paid traffic strategies are sometimes referred to as “Pay per click (PPC)” or “Cost per click (CPC)” campaigns. This nomenclature accurately describes the cost structure for this type of strategy. Instead of investing some amount of money and hoping for results, PPC campaigns only make you pay for the clicks you actually acquire. You pay a fixed amount of money for each instance of a user clicking your ad to come to your site. This rate is determined based on the demand for the keyword you choose to advertise for. PPC campaigns are most popularly run through Google AdWords, an online platform that helps businesses organize and track the success of paid traffic marketing. These ads appear on the right side of search queries for keywords that you specify, but you don’t pay anything unless people click through. It’s important to note, other sites like Facebook and Twitter are using their user profiles to allow businesses to advertise to a targeted segment. Paid traffic allows you to target specific demographics very easily. With research tools, you can calculate search volumes and demographic trends for specific keywords, and tailor your ad messages to focus on those key demographics. Like with most other online marketing strategies, the longer you run the campaign and analyze the results, the more accurate you’ll become in your execution. Do your research. Know who you’re targeting and why. Proven industries for paid traffic include finance, travel, and shopping. Design a specific landing page just for PPC conversions. This will help you convert more PPC leads and encourage more traffic. Use carefully written copy to ensure maximum visibility and interest. Test it to ensure its effectiveness, and make adjustments as necessary. While I haven’t covered every nook and cranny of online marketing, these nine pillars form the crux of a solid online marketing presence. There are many ways to leverage these strategies effectively, but all of them take time and practice to perfect. Do your research as thoroughly as possible before starting. Focus on both inbound marketing strategies for the best results. Be consistent, both in your brand presentation and in the frequency of your updates. Use quality design and writing to capture more leads and earn more conversions. Track everything you can. Use measurement and analysis as tools to improve your performance. Your lead generation machine can’t be created overnight, but with time and dedication you can use these online marketing strategies to take your small business to the next level. Stay consistent and be patient; with the proper channels aligned and enough syndication, your revenue can increase many fold.